It may be hard to imagine San Diego County awash in fields of grain, but from the 1860s to the early 1900s, wheat and barley were big crops. 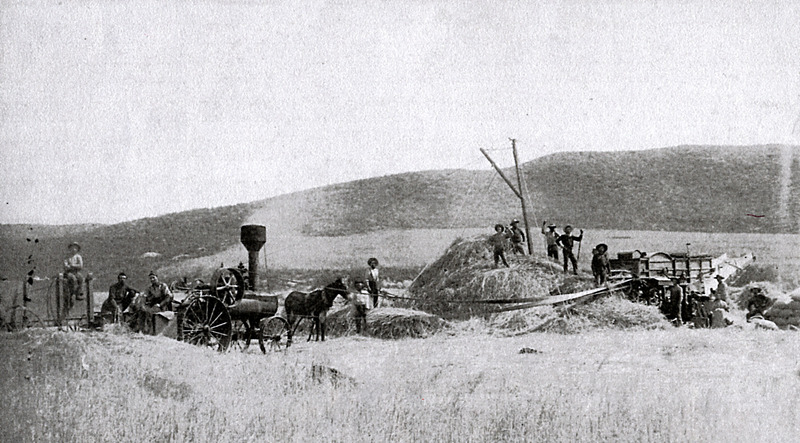 “The first wheat of the season reached W. W. Stewart’s warehouse Thursday morning from Scott’s ranch in the Rincon district,” began an article in the July 17, 1890 San Diego Union, about the arrival of a mule-train bearing six tons of wheat. Threshing—separating the grain from its cob or husk, then cleaning it and gathering or stacking it, was already a mechanized process by that time, done by machines powered by steam tractors. Even with the help of a machine, it was a very labor-intensive process. Threshing crews averaged 18-20 men, and one job could take over a week. The threshing rigs were large and too expensive for many smaller farmers. So the owners of such equipment, in addition to using it on their own farms, rented out their services to other farmers as well. Some farmers joined threshing crews moving around the county after their crops were in to earn some extra money. It was hard work, and it could be risky work with sharp edges and sometimes unpredictable steam boilers. He was lucky. Reports of more serious injuries from fires or explosions, as well as destruction of crops and equipment, often show up in the press of the day. Separating the wheat from the chaff could sure get complicated. Sources for this post included historic San Diego and Poway newspapers, the archives of the San Marcos and Rancho Bernardo Historical Societies, and websites for the Library of Congress and History 101.